Why did this statement disappear from the Senator’s introductory biography text after election? Why is she currently opposing the adoption of HB 309, which would bring a much needed series of intervention programs to the state of Georgia, enabling children with Autism or at risk for Autism, to receive the necessary and scientifically-based therapies that may provide the very positive change she discussed in her About Me text. 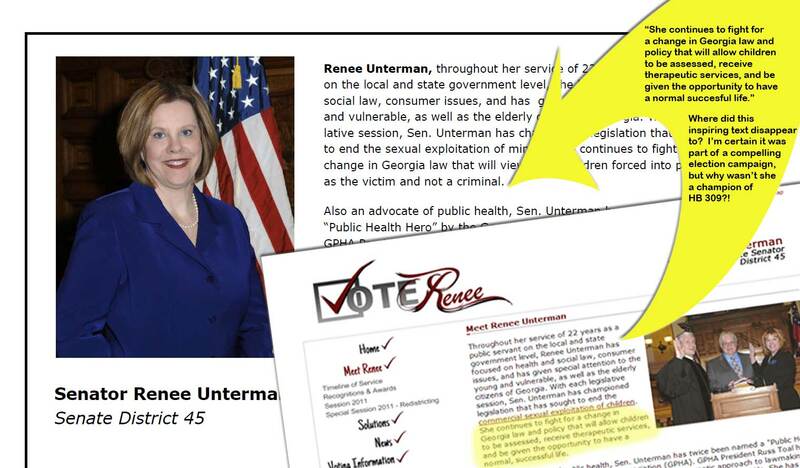 Senator Unterman’s About Me text included this statement in her pre-election promotion, “She continues to fight for a change in Georgia law and policy that will allow children to be assessed, receive therapeutic services, and be given the opportunity to have a normal, successful life.” What happened to this part of Renee Unterman’s biography text? Is it simply forgotten now that the election is over? Most of these therapies are available and covered by insurance for young children and school-age children in nearly 37 other states throughout our nation! Therapies like ABA, play-based, occupational therapy, speech therapy, and many others, provide a roadmap for a more successful development of skills needed for true independence, communication, and future hopes. It is far less costly to provide what each child deserves and needs then it will be to support and provide for those that don’t receive a fair shot at communication and independence! The Senator’s statement, “If she had to pay $100,000 for her own child’s therapy so should they,” is shallow and cold, at best. Not every family has the luxury of a senator’s salary to support such intervention costs! These children deserve to receive the same proven and beneficial therapies currently available throughout most of the United States. If HB 309 doesn’t pass, then the noble concept of our nation’s “No child left behind” policy will fail miserably and all because Georgia legislators decide that these services should remain “Cadillac services” only readily available to those with abundant salaries and financial support. For the price of thirty-two cents each year per person, all children in the state of Georgia could receive the supportive therapy that may change their life substantially, for the better. Yet, Unterman has been reported as stating that she believes this cost is under-estimated. Despite a growing amount of support from Georgia residents, Senator Unterman continues to oppose this bill. Could it be that she is too involved with lobbyists from insurance corporations that fear they may be required to foot the bill for autism therapies like so many reformed insurance providers around our country? She lists her occupation as an insurance executive; perhaps this is the damning connection. Today, hundreds of parents personally visited the capital to show their need for support, but went home very disappointed. I think voting this in should be a no brainer, sadly it appears that this issue has been moved into the mandate committee – a place where it could be stalled for another year. I hope that you’ll join me in signing their petition and sharing this message to increase support for Ava’s Law. We need to force legislators who oppose this bill to open their eyes to the necessity of providing early autism therapies. Please take the time to write a brief letter to Senator Renee S. Unterman at 121-H State Capital, Atlanta, GA 30334 or email her at Renee.Unterman@senate.ga.gov. Let’s make certain she knows that our friends in Georgia are not alone in their fight! It turns out a little more complicated in that she did have an autistic son who passed away as a young adult. In stead of giving many logical responses she often cited this as if it gave her a pass from the arguement. However, learing such information only made it clearer that she truly lacked compassion for others in the same situation and is out of touch with reality in that she did not spend 100K dollars on her sons treatment, an amount i dream of as a total for my daughter over several years. No, she spent $100K a year on her son….which tells me she recognized the importace of intervention something she denies common famalies now, and that she is out touch with real life and therefore unable to truly represet those who voted her in. Has Autism Become Invisible to Disneyland?